Former secretary Faria Alam has lost her employment tribunal against the FA. It follows a high profile hearing which re-opened an episode which had rocked English football's governing body. News of the FA secretary's affairs with England manager Sven-Goran Eriksson and chief executive Mark Palios generated endless yards of newspaper coverage, just months after England's unfortunate exit from Euro 2004. Ms Alam claimed that she had only resigned from the FA because her position had been made untenable and that she had been unfairly dismissed. She also claimed breach of contract. But it was perhaps her claim at the tribunal that she was sexually harassed by FA executive director David Davies that was most shocking. She said the former journalist - perhaps best-known by fans for his low-key participation in televised FA Cup draws - had tried to hug and kiss her on a number of occasions. Ms Alam said she had been told at the FA that Mr Davies had "a bit of a reputation", with two colleagues - Kim Foster and Sarah Ford - saying he had "tried it on" with them. Mr Davies had suggested they should run away together, Ms Alam asserted. She also alleged a diary containing allegations of the harassment had been taken from her desk and her e-mail account accessed by FA staff. 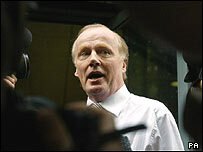 Davies was outraged by the allegations and his legal team fought back. They tracked down both Ms Foster and Ms Ford, who gave statements denying what Ms Alam had said. Her allegations against Mr Davies were further called into question when the Mail on Sunday published an interview with her that had been conducted on 6 August 2004 but never printed. In it, she was asked: "So then, David Davies never came on to you?" The Mail on Sunday said her response had been "No, no" and that she had described him as a "lovely person" who was "jovial and chatty". She told the paper: "I don't see anything bad about him. We had a great rapport and I didn't find him difficult to work for." Recalled to the tribunal on 28 June this year, shortly after the interview was finally published, Ms Alam said she stood by both sets of words. "I'm not being deceitful. I stand by what I said last year and I stand by what I said this year." The tribunal also heard evidence from Colin Gibson, who had been the FA's director of communications, on perhaps the thorniest aspect of the scandal. It heard how Mr Gibson was taped by the News of the World attempting to do a deal with them to try to keep Mark Palios' name out of any stories. Unfortunately, Ms Alam refused to do an interview with the tabloid and it decided printing Mr Gibson's failed efforts at news management would make an equally entertaining story. It quoted him as saying: "What I'm proposing is that I give you chapter and verse on her [Faria] and Sven and get her to do an interview to say that she lied to everybody this week and that it was true. "And the pay-off, obviously, is that we leave MP [Mark Palios] out of it. I've got the details, I've got the places, I've got the phone calls. I've got everything." Mr Gibson said he had been ordered by Mr Palios to "do anything I could to keep it out of the paper, that he was attempting a reconciliation with one of his children and that it could be finished if there were stories about his private life". In the time between the scandal and the tribunal, Mr Gibson had moved on to greener pastures, becoming head of communications at the England and Wales Cricket Board. Mr Palios, on the other hand, has found himself a job in used car sales, as chief executive of the Dixons Group, a string of car dealerships in the north of England. The FA's lawyers said Ms Alam had boasted in e-mails to friends about affairs, referring to Eriksson as "Sugar" and Mr Palios as "Pretty Polly". In one she allegedly wrote: "I want to be... very, very rich". One friend sold some of the e-mails to a newspaper. Ms Alam has always denied allegations that she resigned only in order to sell her story to the newspapers. But the tribunal was told she was in the offices of publicist Max Clifford on the same day she resigned. Ms Alam also claimed during the tribunal that Eriksson had asked her to lie if questioned by the FA on whether they had had a relationship. During the tribunal, her lawyer noted that the FA had not opted to call Mr Eriksson to the tribunal to address this allegation. But the FA's lawyer said an internal inquiry had cleared the England manager. And the FA insisted Ms Alam had only been questioned after asking for help to deal with media intrusion.